The Office of Faculty Development in the Office of the Provost is pleased to announce that applications for the 2019 Junior Faculty Writing & Creative Works Summer Academy (Summer Academy) will be accepted beginning Tuesday, January 22, 2019. Now in its fourth year, the Summer Academy supports faculty success with scholarly publications and/or creative works. Scholarly publications include manuscripts for journal articles, books, book chapters and monographs, with a goal towards publishing in a university press or other academic press. Creative works include original compositions, orchestrations, arrangements, original scripts, adaptations, theatrical designs, choreography, installations and exhibitions of two-and three-dimensional works of art, video and motion graphics, or performance/conceptual works of art and design. Junior faculty who are assistant or associate professors on tenure track are eligible to apply as Faculty Scholars. Junior faculty who are lecturers, instructors or master teachers are also eligible to apply. Junior faculty who participated in the 2016, 2017, or 2018 Summer Academies may apply as long as the junior faculty member is not tenured. Faculty members who apply must be interested in enhancing their scholarly agenda through the process of writing or creating, rewriting or recreating, reflecting, and receiving critical feedback in a summer-long faculty development interdisciplinary learning community. A main highlight of the Summer Academy is the individualized coaching and mentoring each accepted applicant receives from a senior colleague, also known as a Scholar Coach. This year, the Summer Academy will offer up to 24 junior faculty the opportunity to participate as Faculty Scholars. Junior faculty from all disciplines are encouraged to apply. Faculty in African Studies, Afro-American Studies, Fine Arts, Humanities, History, and Sociology are particularly encouraged because the Summer Academy is underwritten, in significant part, by The Andrew W. Mellon Foundation, therefore up to seventy-five percent of the available slots will be designated for faculty in those areas. The Office of Faculty Development (OFD) in the Office of the Provost sponsors the Junior Faculty Writing & Creative Works Summer Academy ("Summer Academy”) to support faculty success with their scholarly publications and/or creative works. Scholarly publications include manuscripts for journal articles, book chapters and monographs in a university press or other academic presses. Creative works include, for example, original compositions, orchestrations, arrangements, original scripts, adaptations, theatrical designs, choreography, installations, and exhibitions of two- and three-dimensional works of art, video and motion graphics, or performance/conceptual works of art and design. This Academy will offer up to twenty-four (24) junior faculty the opportunity to participate in this community of scholars from Howard University. Additionally, the Academy seeks the service of twelve (12) Scholar Coaches who will provide mentorship to the 24 Faculty Scholars. Each Scholar Coach will mentor two Faculty Scholars. Who Should Apply for the Faculty Scholar Opportunity? Junior faculty who are assistant or associate professors on tenure track should apply. Junior faculty who are lecturers, instructors or master teachers are eligible for this program. Junior faculty without tenure who participated in the 2016, 2017, or the 2018 Summer Academy are also eligible to apply for the 2019 summer program. Faculty members who apply must be interested in enhancing their scholarly agenda through the process of writing or creating, reflecting, and receiving critical feedback in a summer-long faculty development learning community. The key components of this Summer Academy include: coaching through the writing or creating process of a publication or creative work, and interacting with peers and senior colleagues about successful strategies focused on enhancing your scholarly productivity. As Summer Academy participants, junior faculty will commit to writing and submitting a piece for publication or producing a creative work for submission to a juried show or other exhibition opportunity, for an exhibition design, a musical/theatrical recording/performance, or for a workshop presentation. A small stipend will be provided to each Faculty Scholar who successfully completes the program with a submitted piece for publication or jury consideration. To be considered for the Academy, the faculty member must submit an application and an abbreviated CV by Thursday, February 28, 2019, by 4:00 p.m. Faculty from all disciplines are encouraged to apply. This Summer Academy is underwritten, in significant part, by The Andrew W. Mellon Foundation, therefore up to seventy-five percent of the available slots will be designated for faculty in the Fine Arts, Humanities (English, Classics, and Foreign Languages), History, Sociology, African Studies, and Afro-American Studies. Faculty members who participate in this opportunity must commit to attending the Academy in its entirety. The schedule for the Summer Academy is provided at Section 5 below. Who Should Apply for the Scholar Coach Positions? Senior and mid-career faculty members who have excelled in two areas should apply. The Summer Academy is seeking colleagues who have a distinguished track record of maintaining a steady regimen of scholarly production to mentor Faculty Scholars. In addition to scholarly productivity, Scholar Coaches should also have an equally long and distinguished history of patiently and successfully mentoring junior colleagues. In other words, senior and mid-career colleagues who thoroughly enjoy and have mastered the craft of providing mentorship to non-tenured full-time faculty are encouraged to apply. Senior and mid-career faculty from any discipline can apply. A stipend will be provided to Scholar Coaches who successfully mentor Faculty Scholars. To be considered for the Academy, the faculty member must submit an application and an updated CV by Thursday, March 7, 2019, by 4:00 p.m.
Each applicant must provide proof that the final product was submitted to a publisher or appropriate external party for the creative work to the OFD by Friday, September 13, 2019, by 4:00 p.m.
A network of colleagues across the University to support you beyond the Summer Academy. Review of Application. The applications will be reviewed by a three-person committee composed of the two co-directors of the Junior Faculty Writing & Creative Works Summer Academy and the Associate Provost for Faculty Development. Decisions will be sent to Faculty Scholar and Scholar Coach applicants no later than Monday, March 25, 2019. Friday, August 16, 2019, 4:00 p.m.
Friday, September 13, 2019, 4:00 p.m. Important Note: Each Junior Faculty, Faculty Scholar, and Scholar Coach signs a contract committing to programs. If a Junior Faculty, Faculty Scholar or Scholar Coach withdraws more than 24 hours after signing the contract, they will be responsible for expenses incurred by the program management staff on their behalf. If you have questions about the program or the application, then please contact either of the Co-Directors of the Summer Academy or Ms. Jacqueline Young, Program Manager, Office of Faculty Development, Office of the Provost, at jyoung1@howard.edu. Also follow the Office of Faculty Development on Twitter @HUFACDEV for regular updates on the 2019 Summer Academy. 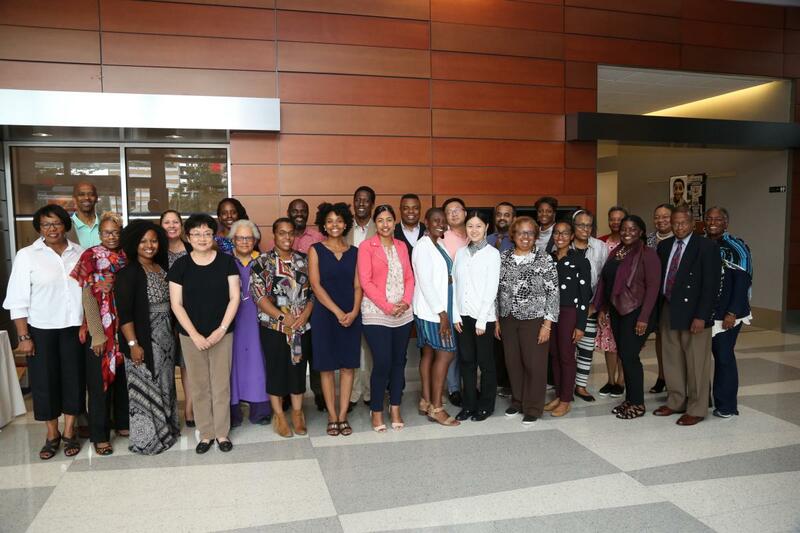 Pictured: Members of the 2018 Junior Faculty Writing and Creative Works Summer Academy at Howard University, July 2018.